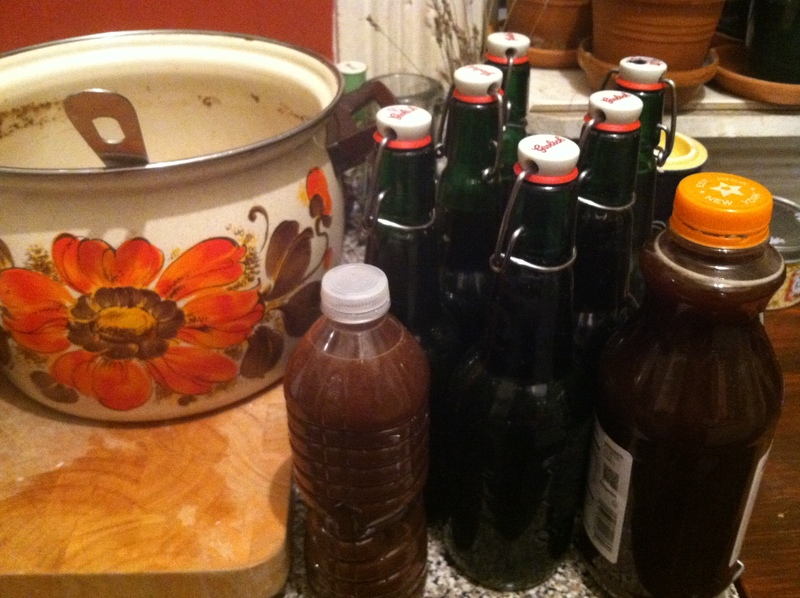 Last month I made my latest batch of ginger beer, a project which I tend to do once a year around this time. 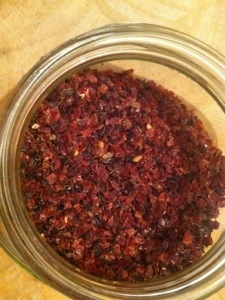 Ginger is great at any time, but cool weather prompts me to use warming spices. There are different ways to go about making ginger beer. Three methods are listed below. A few years ago, I invested in a ginger beer plant from a fermenter in England. Ginger beer plant purportedly is the most “genuine” way to make ginger beer. Unfortunately, my ginger beer plant did not last very long. 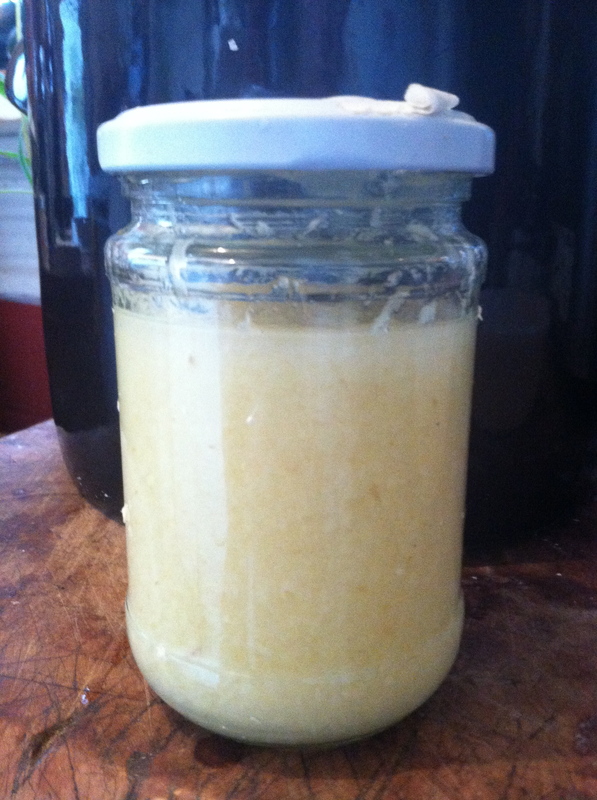 The process of using it is a little bit like fermenting with water kefir, but the grains of ginger beer plant reproduce more slowly and are much finer than tibicos. With each ferment I did, I lost some of my grains. I was using a kitchen towel to strain the grains out, and inevitably, the fine grains would adhere to the towel and I would not be able to recover them all. I already have three other types of starter to play with, so I was only a little sad as I watched the ginger beer plant whittle itself slowly away. The beverage that the ginger beer plant produced was pleasant and different, but not necessarily superior to my tastes. 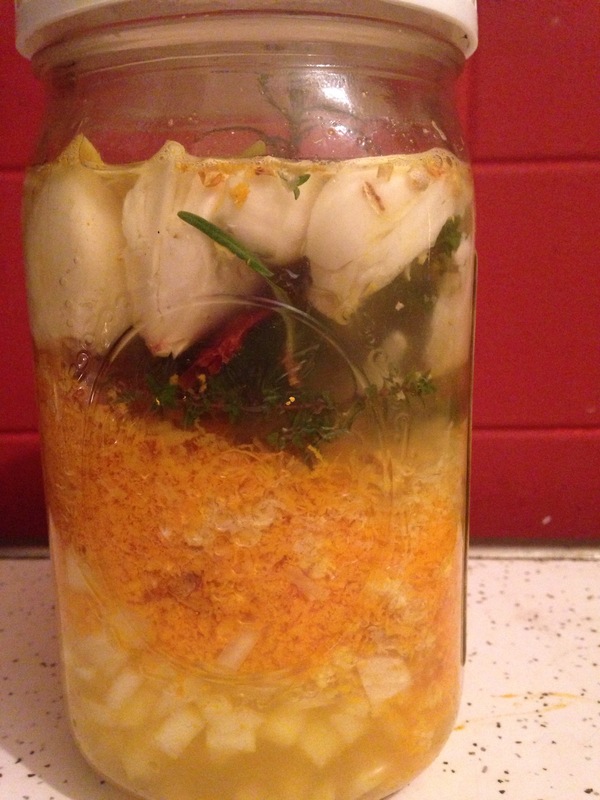 If you have water kefir (tibicos) grains hanging around, this would be another way to make ginger beer. 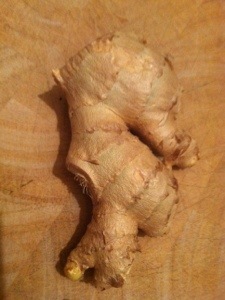 The brew method would be comparable to making ginger beer with the ginger beer plant. and create any number of flavored sodas with it. That’s the ginger bug right before I decanted it. It got to a point where it was bubbly enough that I was keeping the jar inside a bowl in case of overflow, to save my countertop from stickiness. Grate 2 tsp of fresh ginger. Put it in a pint sized jar. Get as much of the juicy stuff in as you can. Add 2 tsp of white sugar, and 1 c water. Seal the jar and shake it. Let it sit. Every day, add another 2 tsp of ginger and 2tsp of sugar, and shake the jar daily or more. After a few days or up to a week, your mixture will get bubbly. You will see the bubbles when you shake, but also beforehand. This bubbly brew is your ginger bug. You have effectively invited the yeasts from the air to inhabit your sugar-ginger-water mix. Boil half a gallon of water. Add 1 to 1.5 cups of sweetener to the water. While the ginger bug is necessarily made with white sugar to attract your yeasts, this sweetener could be anything: maple syrup, birch syrup, sucanot, brown sugar, molasses. I recommend staying away from honey. 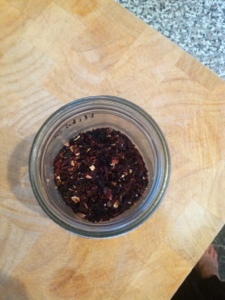 This last batch I did was with molasses, and it gave the whole drink a beautiful, rich color. Mix well to dissolve your sweetener, then mix in another half gallon of water. Your mixture should now be cool enough to comfortably touch. Add the juice of 2 lemons, and the liquid from your ginger bug. Taste your mix. If you want it to be more gingery, grate some more fresh ginger and squeeze the ginger juice from your gratings into the pot. 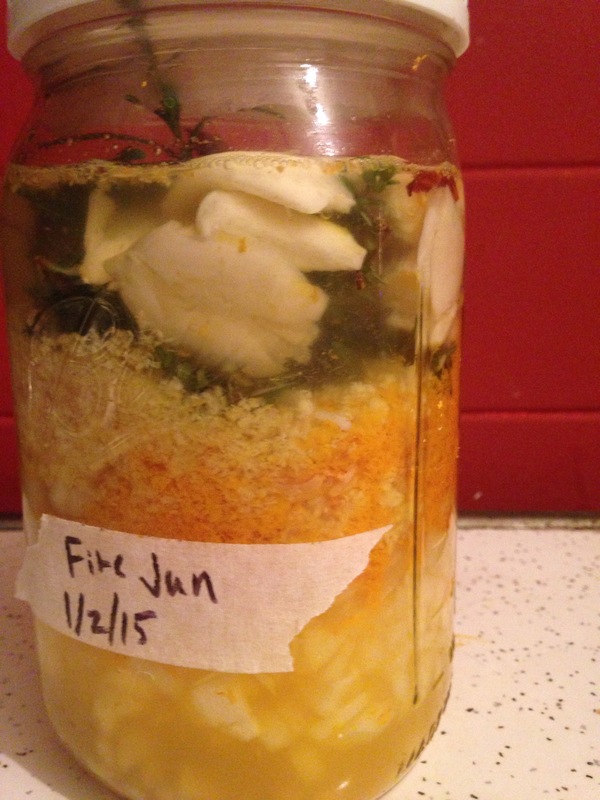 Let this mixture sit for about a week, covered to keep out flies, and then bottle it. The bottled brew. Notice how I have a couple plastic bottles in the batch. These are handy in testing your carbonation levels: when the plastic bottle gets more rigid to the touch, you know it’s ready to transfer to the fridge. Depending on how active your culture is, you can leave the bottles out at room temperature for some time to build up bubbles. A good test is to use at least one plastic bottle. When the plastic becomes rigid from the pressure of gas build up, it’s time to “burp” your bottles and put them in the refrigerator. Otherwise, you can end up with glass bombs that are quite dangerous! (See my cherry explosion incident from last summer). The safe bottle time at room temp could be as short as a few hours, especially if you do this in the summer, to about two weeks. I have had batches at both extremes. If you really dig ginger beer, you could now add another cup of water to the sediment left over from your ginger bug, and begin feeding it sugar and ginger every day again. The culture may be ready sooner this time, as you have already gotten the organisms started. I’ve never tried to keep my bug going, as I couldn’t keep up with drinking it. 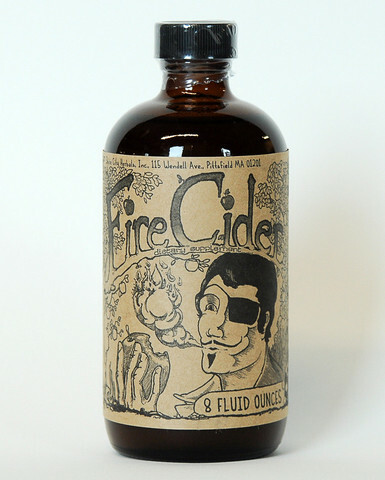 If you want to make this an especially “warming” drink, add some dark rum to your glass, and an optional wedge of lime. Now you have a dark n’ stormy! 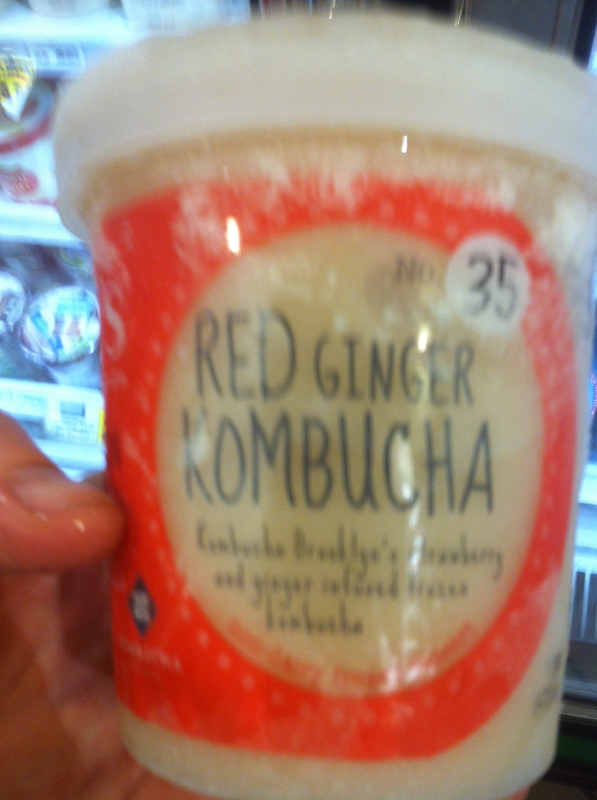 Ginger kombucha? I can do that! 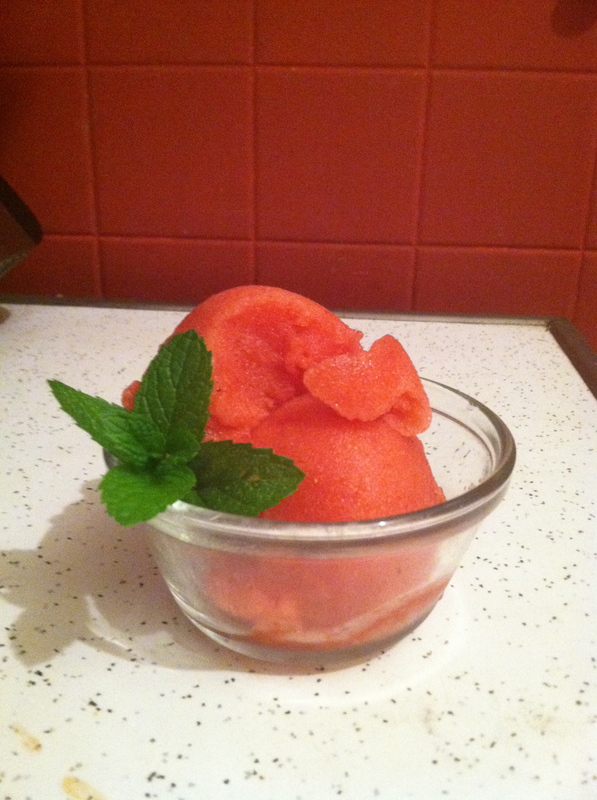 That’s right, kombucha sorbet, infused with strawberries and ginger! It was over $6. So, i didn’t buy it, but rather took it as a challenge. You know what I did the second I got home: I made my own. My guess is that mine is much nicer. It certainly came out a much rosier color– at some point I’ll buy a pint for comparison. The finished product, with a garnish of mojito mint from my fire escape garden. 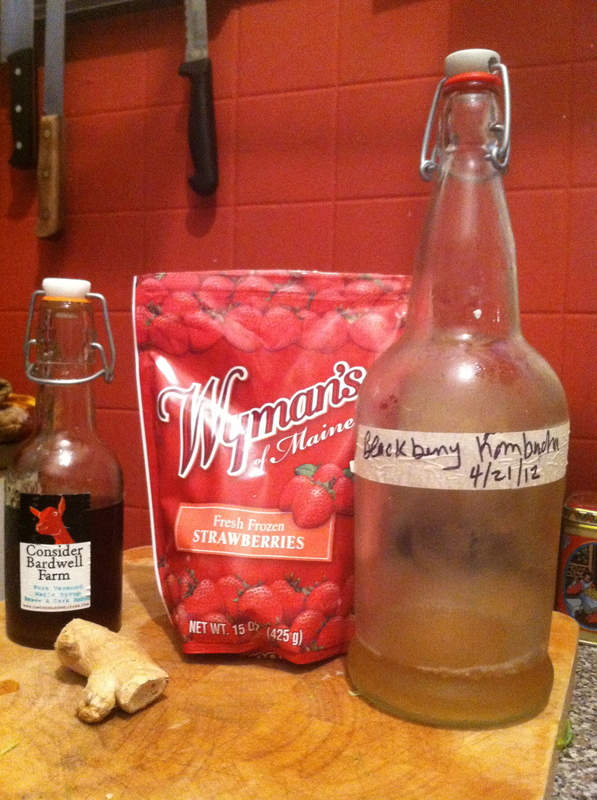 Once you have made kombucha, this couldn’t be easier, so long as you have the equipment: a blender and an ice cream maker. Grate in 1 inch of peeled ginger straight into the blender. Add 2 T of maple syrup. If all your ingredients are cold, especially if you used frozen strawberries, they should be ready to throw into the ice cream maker right away. Add the cold ingredients to the ice cream maker, let it spin for about 20 minutes. Scoop them out and eat, or put in the freezer. Mmmmm!